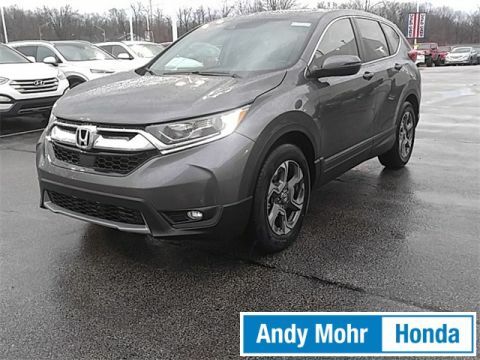 2019 Honda CR-V LX 25/31 City/Highway MPG Get MOHR for your money at the ALL NEW Andy Mohr Honda in Bloomington! Call us today at 812-336-6865. Stk# B90238. VIN 2HKRW6H3XKH204737. Automatic. Leases are for 36 months, 12,000 miles per year with $.20 per mile for excess mileage. $0 down payment. Tax and dealer fees additional. Payments include all available incentives; must qualify. On select models based on Honda Financial Services approval. $0 security deposit. Doc fee of $199. See dealer for details. Ends 04/30/19. 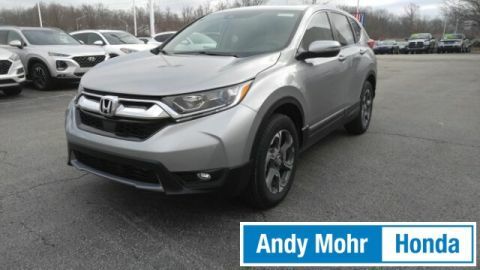 2019 Honda CR-V LX CVT Transmission, Bluetooth*, Advanced Compatibility Engineering (ACE) Body Structure, Vehicle Stability Assist (VSA) with Traction Control, Brake Assist, Multi-Angle Rearview Camera with Guidelines, Alloy Wheels, 17" Alloy Wheels, Automatic temperature control, Radio: AM/FM Audio System w/4 Speakers, Split folding rear seat. 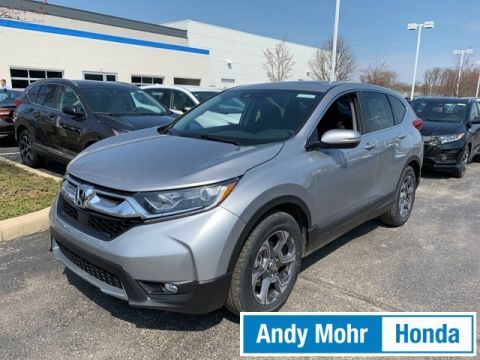 25/31 City/Highway MPG Get MOHR for your money at the ALL NEW Andy Mohr Honda in Bloomington! Call us today at 812-336-6865. 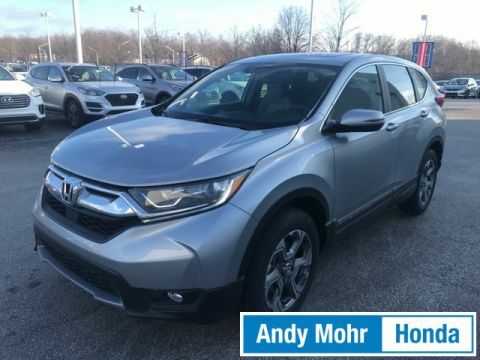 2019 Honda CR-V LX CVT Transmission, Bluetooth*, Advanced Compatibility Engineering (ACE) Body Structure, Vehicle Stability Assist (VSA) with Traction Control, Brake Assist, Multi-Angle Rearview Camera with Guidelines, Alloy Wheels, 17" Alloy Wheels, Radio: AM/FM Audio System w/4 Speakers. 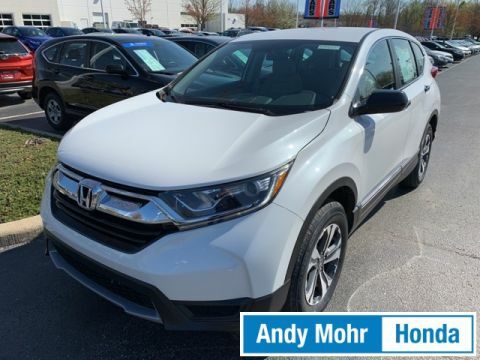 25/31 City/Highway MPG Get MOHR for your money at the ALL NEW Andy Mohr Honda in Bloomington! Call us today at 812-336-6865. 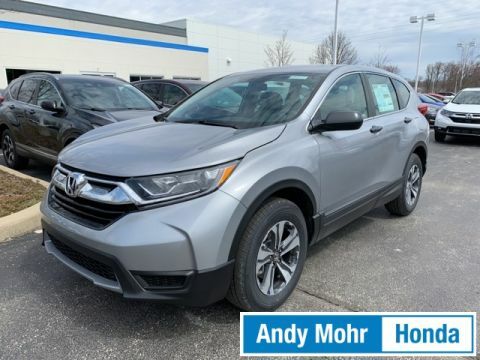 2019 Honda CR-V LX CVT Transmission, Bluetooth*, Advanced Compatibility Engineering (ACE) Body Structure, Vehicle Stability Assist (VSA) with Traction Control, Brake Assist, 17" Alloy Wheels, Cloth Seat Trim, Radio: AM/FM Audio System w/4 Speakers. 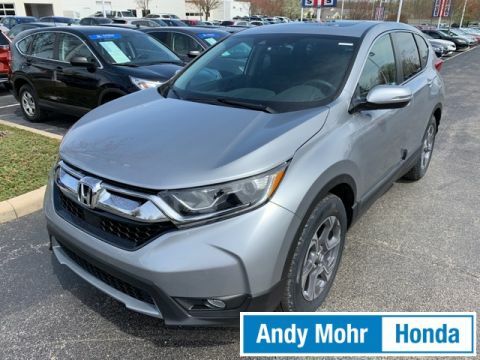 25/31 City/Highway MPG Get MOHR for your money at the ALL NEW Andy Mohr Honda in Bloomington! Call us today at 812-336-6865. 2019 Honda CR-V LX CVT Transmission, Bluetooth*, Advanced Compatibility Engineering (ACE) Body Structure, Vehicle Stability Assist (VSA) with Traction Control, Brake Assist, Multi-Angle Rearview Camera with Guidelines, 17" Alloy Wheels, Radio: AM/FM Audio System w/4 Speakers. 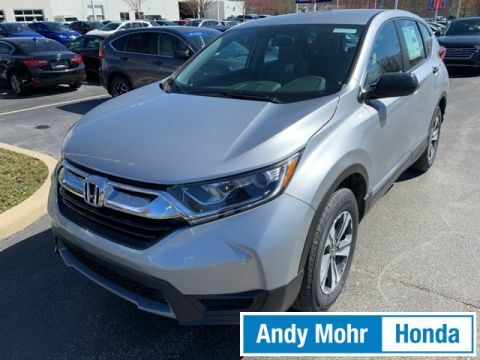 25/31 City/Highway MPG Get MOHR for your money at the ALL NEW Andy Mohr Honda in Bloomington! Call us today at 812-336-6865. 2019 Honda CR-V LX CVT Transmission, Bluetooth*, Advanced Compatibility Engineering (ACE) Body Structure, Vehicle Stability Assist (VSA) with Traction Control, Brake Assist, 17" Alloy Wheels, Automatic temperature control, Cloth Seat Trim, Front Bucket Seats, Radio: AM/FM Audio System w/4 Speakers. 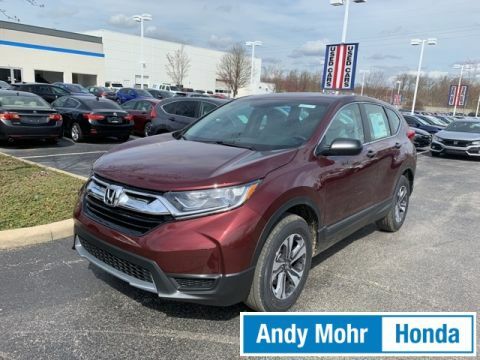 25/31 City/Highway MPG Get MOHR for your money at the ALL NEW Andy Mohr Honda in Bloomington! Call us today at 812-336-6865. 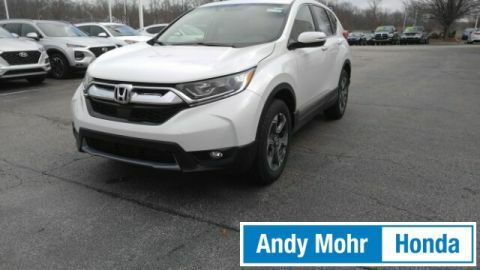 2019 Honda CR-V LX Bluetooth*, Advanced Compatibility Engineering (ACE) Body Structure, Vehicle Stability Assist (VSA) with Traction Control, Brake Assist, Alloy Wheels, 17" Alloy Wheels, Automatic temperature control, Cloth Seat Trim, Front Bucket Seats, Radio: AM/FM Audio System w/4 Speakers, Split folding rear seat. 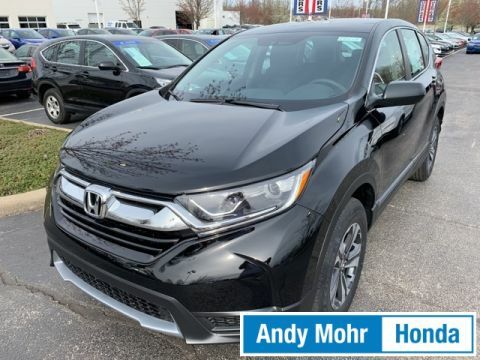 25/31 City/Highway MPG Get MOHR for your money at the ALL NEW Andy Mohr Honda in Bloomington! Call us today at 812-336-6865. 2019 Honda CR-V LX CVT Transmission, Bluetooth*, Advanced Compatibility Engineering (ACE) Body Structure, Vehicle Stability Assist (VSA) with Traction Control, Brake Assist, Multi-Angle Rearview Camera with Guidelines, LED Daytime Running Lights (DRL), 17" Alloy Wheels, Automatic temperature control, Radio: AM/FM Audio System w/4 Speakers. 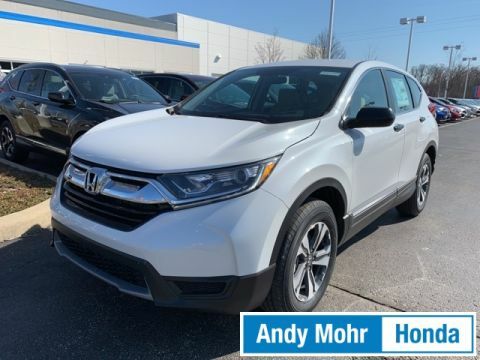 25/31 City/Highway MPG Get MOHR for your money at the ALL NEW Andy Mohr Honda in Bloomington! Call us today at 812-336-6865. 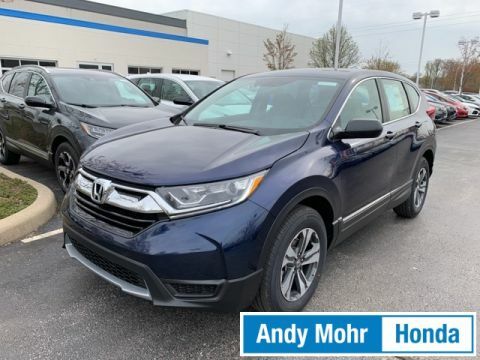 2019 Honda CR-V EX 28/34 City/Highway MPG Get MOHR for your money at the ALL NEW Andy Mohr Honda in Bloomington! Call us today at 812-336-6865. 2019 Honda CR-V EX CVT Transmission, 12-Way Power Adjustable Driver's Seat, Heated Cloth Front Seats, HondaLink Subscription Services, Bluetooth*, Sirius / XM Radio*, Apple CarPlay / Android Auto Integration, Moonroof / Sunroof*, Dual-Zone Climate Control, Smart Entry System with Walk Away Auto Lock, Remote Engine Start, Advanced Compatibility Engineering (ACE) Body Structure, Vehicle Stability Assist (VSA) with Traction Control, Brake Assist, Multi-Angle Rearview Camera with Guidelines, Honda Sensing, Forward Collision Warning (FCW), Collision Mitigation Braking System (CMBS), Road Departure Mitigation System (RDM), Lane Departure Warning (LDW), Lane Keeping Assist System (LKAS), Adaptive Cruise Control (ACC) with Low-Speed Follow, Blind Spot Information System, Cross Traffic Monitor, Automatic High Beams, Fog Lights, Alloy Wheels, Radio: AM/FM Audio System w/6 Speakers. 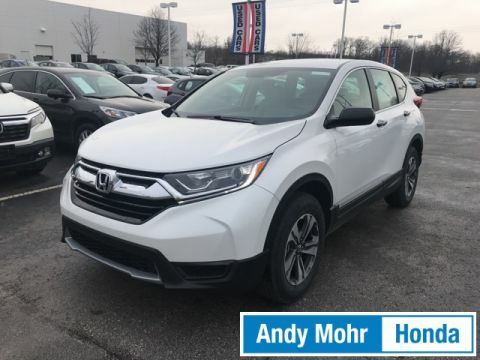 28/34 City/Highway MPG Get MOHR for your money at the ALL NEW Andy Mohr Honda in Bloomington! Call us today at 812-336-6865. 2019 Honda CR-V EX CVT Transmission, 12-Way Power Adjustable Driver's Seat, Heated Cloth Front Seats, HondaLink Subscription Services, Bluetooth*, Sirius / XM Radio*, Apple CarPlay / Android Auto Integration, Moonroof / Sunroof*, Dual-Zone Climate Control, Smart Entry w/ Push Button Start, Remote Engine Start, Advanced Compatibility Engineering (ACE) Body Structure, Vehicle Stability Assist (VSA) with Traction Control, Brake Assist, Multi-Angle Rearview Camera with Guidelines, Honda Sensing, Forward Collision Warning (FCW), Collision Mitigation Braking System (CMBS), Road Departure Mitigation System (RDM), Lane Departure Warning (LDW), Lane Keeping Assist System (LKAS), Adaptive Cruise Control (ACC) with Low-Speed Follow, Automatic High Beams, Alloy wheels, Automatic temperature control, Radio: AM/FM Audio System w/6 Speakers. 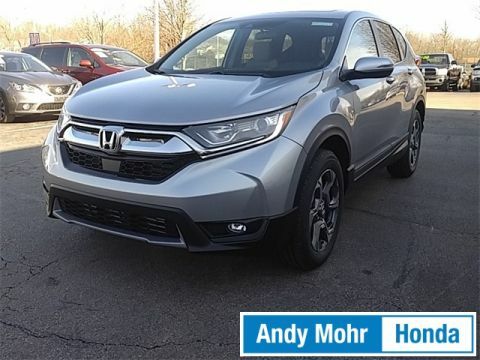 28/34 City/Highway MPG Get MOHR for your money at the ALL NEW Andy Mohr Honda in Bloomington! Call us today at 812-336-6865. 2019 Honda CR-V EX CVT Transmission, 12-Way Power Adjustable Driver's Seat, Heated Cloth Front Seats, HondaLink Subscription Services, Bluetooth*, Sirius / XM Radio*, Apple CarPlay / Android Auto Integration, Moonroof / Sunroof*, Dual-Zone Climate Control, Smart Entry System with Walk Away Auto Lock, Remote Engine Start, Advanced Compatibility Engineering (ACE) Body Structure, Vehicle Stability Assist (VSA) with Traction Control, Brake Assist, Multi-Angle Rearview Camera with Guidelines, Honda Sensing, Forward Collision Warning (FCW), Collision Mitigation Braking System (CMBS), Road Departure Mitigation System (RDM), Lane Departure Warning (LDW), Lane Keeping Assist System (LKAS), Adaptive Cruise Control (ACC) with Low-Speed Follow, Blind Spot Information System, Cross Traffic Monitor, Automatic High Beams, Fog Lights, Alloy Wheels, Automatic temperature control, Fully automatic headlights, Radio: AM/FM Audio System w/6 Speakers. 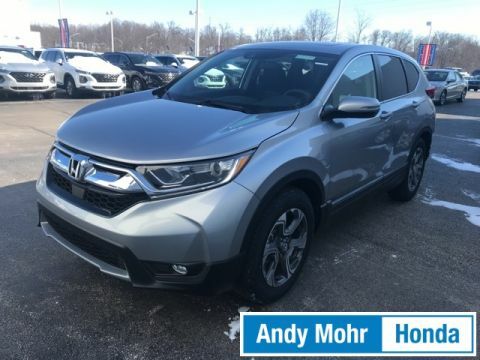 28/34 City/Highway MPG Get MOHR for your money at the ALL NEW Andy Mohr Honda in Bloomington! Call us today at 812-336-6865. 2019 Honda CR-V EX CVT Transmission, 12-Way Power Adjustable Driver's Seat, Heated Cloth Front Seats, HondaLink Subscription Services, Bluetooth*, Sirius / XM Radio*, Apple CarPlay / Android Auto Integration, Moonroof / Sunroof*, Dual-Zone Climate Control, Smart Entry w/ Push Button Start, Remote Engine Start, Advanced Compatibility Engineering (ACE) Body Structure, Vehicle Stability Assist (VSA) with Traction Control, Brake Assist, Multi-Angle Rearview Camera with Guidelines, Honda Sensing, Forward Collision Warning (FCW), Collision Mitigation Braking System (CMBS), Road Departure Mitigation System (RDM), Lane Departure Warning (LDW), Lane Keeping Assist System (LKAS), Adaptive Cruise Control (ACC) with Low-Speed Follow, Blind Spot Information System, Cross Traffic Monitor, Automatic High Beams, Fully Automatic LED Headlights, LED Daytime Running Lights (DRL). 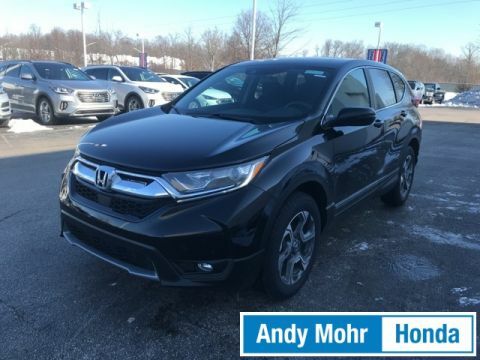 27/33 City/Highway MPG Get MOHR for your money at the ALL NEW Andy Mohr Honda in Bloomington! Call us today at 812-336-6865. 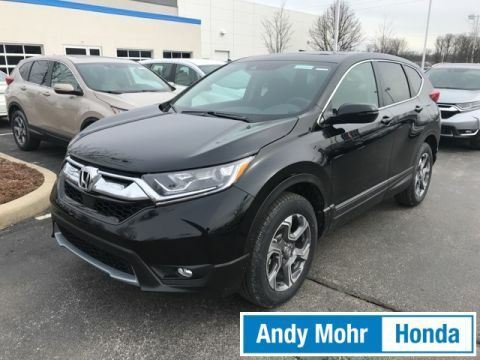 2019 Honda CR-V EX 27/33 City/Highway MPG Get MOHR for your money at the ALL NEW Andy Mohr Honda in Bloomington! Call us today at 812-336-6865. 2019 Honda CR-V EX CVT Transmission, 8-Way Power Adjustable Driver's Seat, Heated Cloth Front Seats, Sirius / XM Radio*, Moonroof / Sunroof*, Dual-Zone Climate Control, Smart Entry System with Walk Away Auto Lock, Smart Entry w/ Push Button Start, Advanced Compatibility Engineering (ACE) Body Structure, Vehicle Stability Assist (VSA) with Traction Control, Brake Assist, Multi-Angle Rearview Camera with Guidelines, Honda Sensing, Forward Collision Warning (FCW), Collision Mitigation Braking System (CMBS), Road Departure Mitigation System (RDM), Lane Departure Warning (LDW), Lane Keeping Assist System (LKAS), Adaptive Cruise Control (ACC) with Low-Speed Follow, Blind Spot Information System, Cross Traffic Monitor, Fog Lights, LED Daytime Running Lights (DRL). 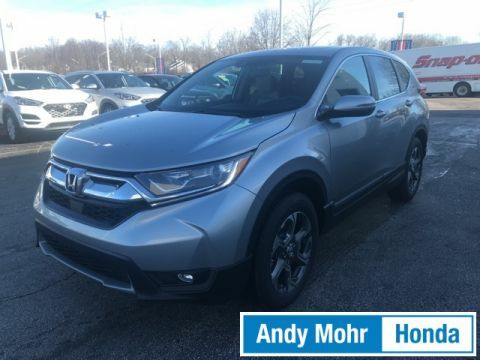 27/33 City/Highway MPG Get MOHR for your money at the ALL NEW Andy Mohr Honda in Bloomington! Call us today at 812-336-6865. 2019 Honda CR-V EX CVT Transmission, 12-Way Power Adjustable Driver's Seat, Heated Cloth Front Seats, Bluetooth*, Sirius / XM Radio*, Apple CarPlay / Android Auto Integration, Moonroof / Sunroof*, Dual-Zone Climate Control, Smart Entry w/ Push Button Start, Remote Engine Start, Advanced Compatibility Engineering (ACE) Body Structure, Vehicle Stability Assist (VSA) with Traction Control, Brake Assist, Multi-Angle Rearview Camera with Guidelines, Honda Sensing, Forward Collision Warning (FCW), Collision Mitigation Braking System (CMBS), Road Departure Mitigation System (RDM), Lane Departure Warning (LDW), Lane Keeping Assist System (LKAS), Adaptive Cruise Control (ACC) with Low-Speed Follow, Blind Spot Information System, Cross Traffic Monitor, Automatic High Beams, Alloy wheels, Automatic temperature control, Radio: AM/FM Audio System w/6 Speakers. 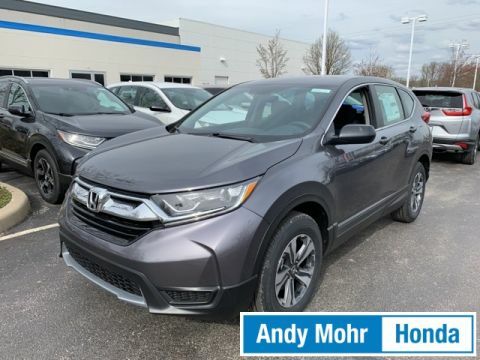 27/33 City/Highway MPG Get MOHR for your money at the ALL NEW Andy Mohr Honda in Bloomington! Call us today at 812-336-6865.